The inner ear, brain (cerebellum), eyes, and proprioceptive system (muscles and joints) are the four components involved in the maintenance of normal equilibrium. A common inner ear disorder that causes vertigo and imbalance is Ménière’s disease: “glaucoma of the inner ear.” Most patients understand that increased pressure in the eye causes glaucoma and blindness. Similarly, increased inner ear fluid pressure produces the symptoms of Ménière’s disease. In Ménière’s disease, the increased fluid pressure causes vertigo, deafness, ear ringing (tinnitus), ear fullness. There is often nausea and vomiting. The endolymphatic sac, which is found in the mastoid bone behind the outer ear, normally drains endolymph fluid from the inner ear. It is believed that either a defect in absorption or excess secretion of fluid results in an increase in pressure in the inner ear. The distended membranes rupture intermittently and produce violent vertigo, hearing loss, tinnitus, stuffiness, and fullness in the ear. Medication usually controls the cause of glaucoma and increased pressure in the eye, but it has little effect on the cause of Ménière’s disease. The frequency of attacks is unpredictable. The natural history indicates that 50% of patients will be free of vertigo after two years. Fifteen percent of patients develop Ménière’s disease in the opposite ear. During an acute Ménière’s attack, medications may be prescribed to help shorten the episode of vertigo, nausea, and vomiting. In some cases, medications may also be prescribed to help improve hearing and inner ear function. Patients are usually given a diuretic and placed on a low-salt diet for months in an effort to reduce inner ear pressure. When medication fails to control the disease, surgery may be indicated. Surgery is usually not indicated in bilateral Ménière’s disease. Stress sometimes can precipitate an attack of Ménière’s disease. Physical exercise can be helpful in reducing stress. Avoidance of substances containing caffeine may be advised. If the history and diagnostic blood or skin test indicates an inhalant allergy, desensitization therapy may be recommended. Self-treatment of the inner ear using the Silverstein Microwick™ is a Minimally Invasive Procedure. It has been found that the antibiotic gentamicin can destroy the balance cells of the inner ear. This medication is given directly into the inner ear using a Micro Wick™ developed by Dr. Herbert Silverstein. This method is effective in relieving attacks of Ménière’s disease in 85% of patients while preserving the hearing in 95%. The Micro Wick™ and tube are manufactured by Micromedics of Minnesota and was FDA approved in September 1999. The Micro Wick™ is placed through a tiny tube in the eardrum, and rests against the round window membrane, the doorway to the inner ear. 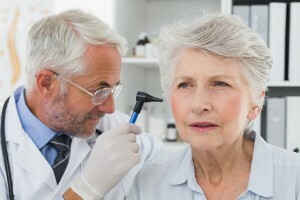 This new technique uses dilute gentamicin optic solution that the patient places in the ear canal three times a day for two to four weeks. This self-treatment method is similar to treating eye diseases with eye drops. Thus far, the results have been excellent in relieving vertigo attacks and preserving the patients’ hearing. Also, in 60% of patients, the pressure and tinnitus have been reduced. This minimally invasive office procedure is done using local anesthesia. A surgical blade or laser is used to make an opening in the eardrum through which a tiny endoscope is inserted. Any obstructing membranes near the round window membrane are easily removed before the Micro Wick™ is inserted. Next, a tiny vent tube is inserted in the eardrum opening. The round window membrane is clearly seen, and the Silverstein Micro Wick™ is inserted. The Micro Wick™ allows the entamicin to reach the round window membrane and diffuse into the inner ear fluids. The treatment is easy, painless, and well-tolerated by patients. After the treatment, the tube and the Micro Wick™ are easily removed in the office. The opening in the eardrum rapidly heals in several weeks. There have been few complications, and the results have been excellent. Approximately 35% of patients may experience some hearing loss from the gentamicin. The Micro Wick™ technique represents an exciting new method for treating Ménière’s disease and allows the delivery of new medications, as they are developed, to treat various other inner ear diseases such as sudden deafness and certain types of deafness. Only 8% of patients need further treatment.